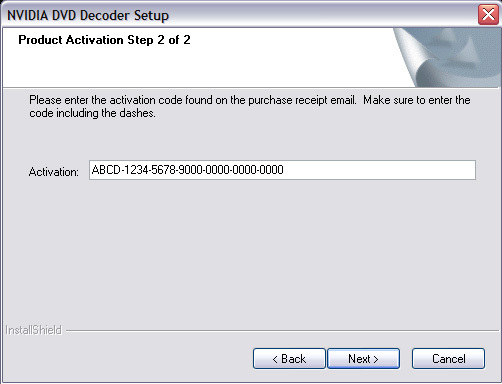 I purchased the NVIDIA Purevideo Decoder software, and during the installation when I type in the activation information, the software gives me an error message. Please do the same for the second Product Activation screen. 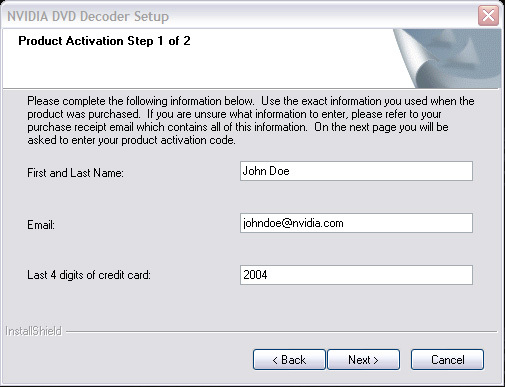 If you have copied the activation information correctly, installation should proceed without any problems, and your NVIDIA Purevideo Decoder software will be unlocked and ready for use. If the Installshield is still stating that an item is incorrect, please check that you do not have any spaces after you type in the information into each field. For the example above, if you are typing in the name "John Doe" in the First and Last Name field, do not type "John Doe ". If you have a space at the end, simply move your cursor to the end of the text and click on the Delete key on your keyboard a couple of times to remove the trailing spaces. Last but not least, please make sure you are logged in with Administrative privilages on your Windows XP Home Edition, Windows XP Professional or Windows XP Media Center Edition PC. Otherwise, Windows will not allow the software to be installed properly.